In the 1994 issue of the Hay Bay Guardian, we did a biography of William Casey (1760-1842), one of the subscribers of 1792. 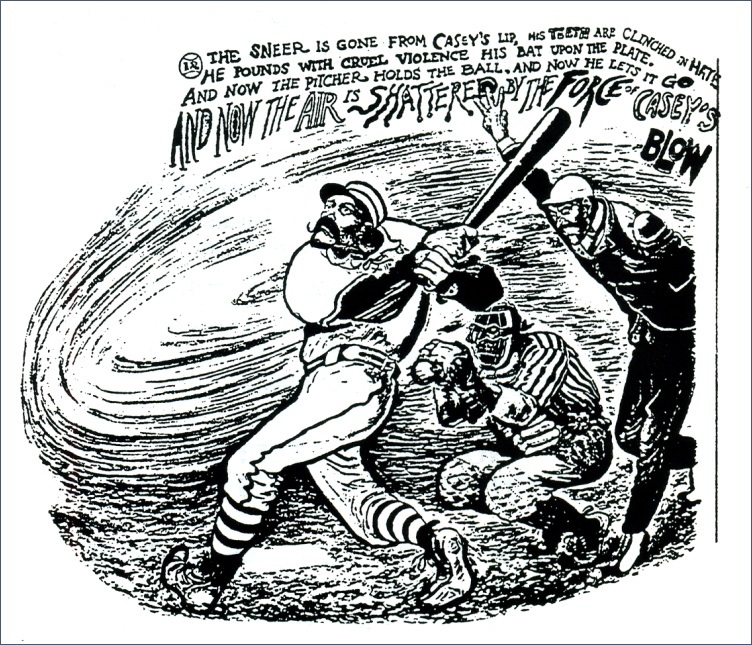 We also featured his great-grandson, Orrin Robinson Casey, a native of Newburgh, Ontario, who claimed to be the original model for Ernest L. Thayer’s immortal poem, “Casey at the Bat,” first published in the San Francisco Examiner on 3 June 1888. 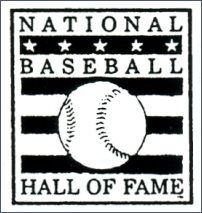 A bit of a nagging doubt made us send off an enquiry to the National Baseball Hall of Fame in Cooperstown, New York. We are grateful for a recent reply from Public Services Librarian, Timothy J. Wiles, who sent us a great deal of enlightening material, to which we now refer. O.R. Casey died in Syracuse, N.Y., on 28 November 1926, aged 77. 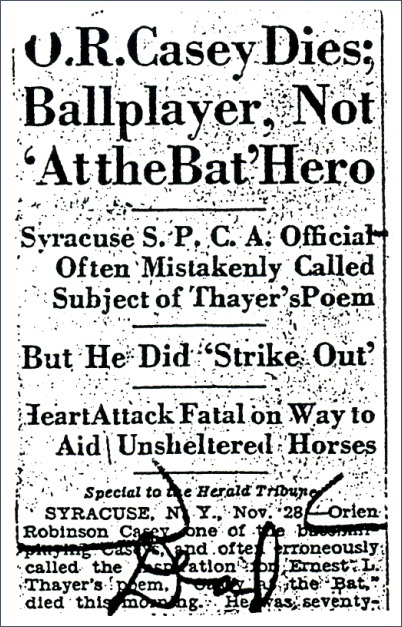 He was chief of the Syracuse branch of the Society for the Prevention of Cruelty to Animals. In that capacity he had gone to investigate a report that horses were being exposed to the cold in unsheltered fields. A heart attack took him before he got there. 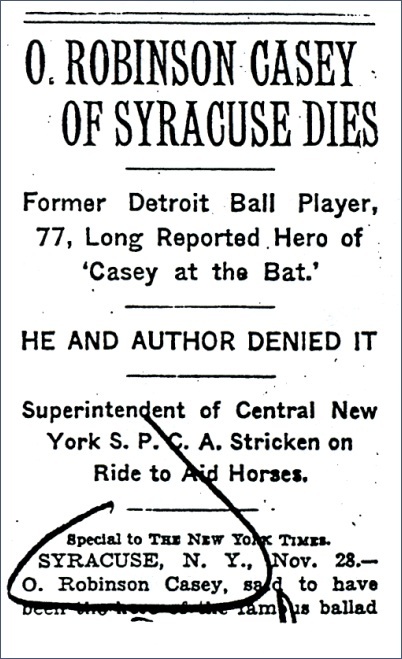 Apparently there were several baseball players who had claimed to their dying day that they were the original “Casey.” The Syracuse World-Telegram loyally insisted the their fellow citizen, O. Robinson Casey, was the real Casey, and quoted much of the poem in his obituary. However, the same day the New York Times and the Herald-Tribune also featured him, but with a different story: his denial of the attribution. “My name is Casey and I played ball for twenty years, as catcher and third baseman, and several times I struck out with the bases loaded and two men out. But as for being the real, the genuine, the ‘immortal’ Casey, the chances are 100 to 1 against it… I was playing ball then on a semi-pro team in Syracuse, and it is most unlikely that the young man fresh out of Harvard, who wrote the poem in San Francisco, ever heard of me. But there is no joy in Mudville—mighty Casey has struck out!